...the annual Stetson New Pilots Fun Fly Event! Well another great Stetsons flying event has passed, our final flying event for the year. Big vote of thanks for our clubs Wing's program, our CFI Fred Lottes, all our instructors, the club executive and of course, the students themselves, well done guys. What else can be said, great morning of activities, flying, fair winds, heat, several flights of Geese, some beautiful flight demonstrations (Elckar, and John Stewart), and of course, our Flight School presentations. Special thanks to all our Registration and Kitchen volunteers Sue MacDonald, Jess MacDonald, Daniel Marcotte, and Jim Denyer, your combined efforts make these events happen. Last but not least, our sponsors, Great Hobbies and Orleans Hobbies, thanks guys, your continued support makes our hobby happen, The entire Stetson Flyers membership wish both your stores all the best. Photos: Hal MacDonald. Click image above for the album. ...the annual Stetson Giant Scale Rally & Pig Roast Event! This year's Giant Scale Rally and Pig Roast was a huge success by any measure. Light winds and sunny skies brought out many pilots and guests. We had pilots from around the Ottawa area as well as Kingston, Napanee, Cornwall and Montreal. There was plenty of flying and camaraderie. Although we had a few mishaps it was a safe and enjoyable weekend. We had 47 registered pilots and served 60 guests for dinner and I don't know how many airplanes. I would like to thank the Executive for all their help as well as volunteers Jennifer Armstrong, Helene Glandon, Sylvie Picard, Sue MacDonald, Jim Denyer, Ed Whynott, Mike Gratton, Don Glandon and Peter Mojsej for their help. Special thanks to our sponsors Orleans Hobbies, Great Hobbies and Meatings.ca. This event is great for our club and the feedback about our field has been outstanding. I look forward to seeing what the next director can do with the event. 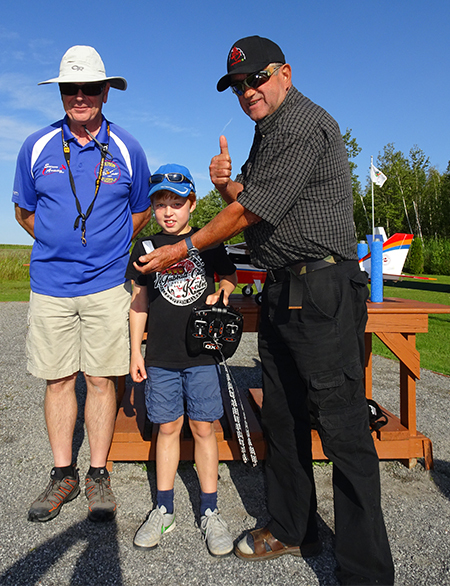 Under the watchful eyes of the Stetson C.F.I Fred (right) and instructor Pierre (left), young Jakob U. got his wings today and in doing so not only joins the Stetson Flyers club as a solo pilot but becomes the youngest in club history to do so at 8 years old... congratulations Jakob!! ...the annual Stetson IMAC competition! It was a dark and stormy forecast... but we waited it out and fortunately, it passed through overnight Friday and left us alone for the rest of the weekend! We caught the edge of an afternoon storm about 3PM Saturday, but we were nearly finished, so no harm, no foul! We had 18 registered pilots for the event, and nearly all made it for the weekend. We had a great group of folks from Ottawa, the GTA, Montreal and Sudbury. This year, based on what we witnessed in Sudbury, we flew one only flight line, which worked out very well. Much easier to organize, and much reduced hazard! We flew a total of 126 competition flights in the day and a half, and had ZERO events! Not a single dead-stick, aborted flight, or incident. One minor nicked finger was all we could conjure up for excitement! Many thanks to First Responder Mike Lalonde and Dr. Guy Ungerechts for providing more care than he probably wanted! With really GREAT support from the Stetsons, there were lots of folks available to man the canteen both days, help with judging and scribing duties, assist with setup and cleanup, and complete all the myriad duties an event like this requires. Jim Denyer did the heavy lifting for the canteen both days, and with Barry and Fred plus many other Stetson volunteers, we were well served! Thanks very much, folks! Michel Boulerice and Dave Martin provided scoring and judging/flight line control, creating a very smooth event for us pilots. Results were super-quick, and both of these guys were really helpful whenever asked for something. A big IMAC THANK YOU to both these guys for a job well done! Saturday Night was the Pilots and friends dinner, attended by several Stetson helpers as well, which was very nice. We chowed down at the Lone Star Restaurant, near St.Laurent Mall, and enjoyed a great meal with the gang. This Saturday evening out is always great fun, as the pilots study their unknowns and practice with their stick planes...the other patrons must think we are a bunch of playground escapees! When all was said and done, we had two guys successfully complete their first ever IMAC event, and both enjoyed the experience! Congrats to Guy and Mike! Sportsman: 1. Dan Reichert 2. Dave Percy. Intermediate: 1. Domenic Teti. 2. Paul McMillan. 3. Brendan Grace. All pilots went home with really great looking 8 x 10 photos, thanks to Dave Percy, and Stetson Coffee Mugs, thanks to our own John Jackson, through his company "Things Made". We were very pleased to draw for several gift cards and some swag from Great Hobbies and Thunderbolt. Many Thanks to these businesses for their continued support of the IMAC community! That's a wrap for now, folks. Just a reminder, Aerobatics is fun and everyone is welcome! ...the annual Stetson Canada Day at the Aviation Museum Event! Despite the new restrictions and regulations imposed by the Aviation Museum, today was a complete success for the Stetson Flyers; with over 26 planes/Jets, 9 Helicopters and 13 drones on display. The Stetsons were well represented and were really appreciated by the visitors of all ages. Because all outside displays were cancelled due to the inclement weather, the inside of the museum was well attended. We had two flight simulators running provided by Hal MacDonald and Nicholas Miltrea. Jim Denyer set up several drones with cameras so visitors could experience the view from the (goggles) viewer. From your executive: Daniel Marcotte, Hal & Sue MacDonald, Pierre Coulombe and Bob Myhara. From your members: Les Morgan, Wayne Karperien, Pat Hennessey, Jim Denyer, Len Streefkerk. Peter Wakefield, John Jackson, Nicholas Mitrea, Jessica Dawson, Tom Pellows, Elckar Monsalve. Kevin McDougall, Marc Pichette, Nigel Chippindale, Stephane Plouffe and Louis Simon. Many thanks to all those who participated and made this day a success for both the Stetson club and the Aviation Museum. ...the annual Stetson Heli/Multi-rotor Fun Fly Event! The weather was terrific considering the forecast outlook. With 13 registered pilots and a lot of rotor hardware on hand, everyone had a great day. 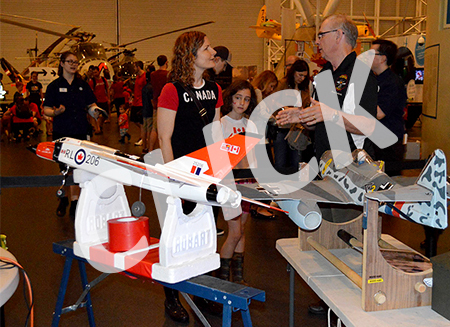 Many thanks to the sponsors: Great Hobbies, Orleans Hobbies, Peter Wakefield and Dominion City brewing for the pilot prizes... and many thanks to the volunteers who made the day a success: Hal, Sue and Jessica MacDonald, Debbie Denyer, Dan Marcotte (canteen Dan), Dan Guertin and Chris Ferry. 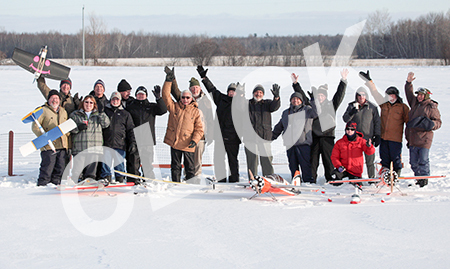 Thanks to those pilots who travelled from Gatineau and Perth to join us, hope to see you next year as well. 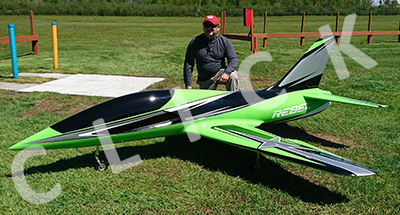 Peter's turbine heli is always a show stopper and so was Pierre's recently completed super scale AStar. Nice job Pierre ! Let's do this again next year ! ...the annual Stetson Ed Rae Memorial Fun Fly Event! 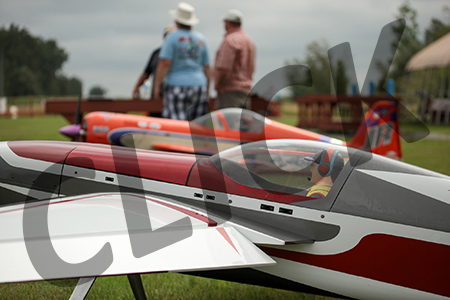 The Ed Rae Memorial Fun Fly was held today. Despite the wind and the really cool temperature of 10 degrees this morning, the event was a success. We had 25 registered pilots and approximately twenty five spectators to enjoy the show. I would like to thank the Ed Rae family for once again gracing us with their presence. Ed was a founding member of this great club, and his contributions and tireless efforts will never be forgotten! Thanks to Gerry Nadon who delivered a nice speech about Ed Rae and also thanks to Great Hobbies and Orleans Hobbies for their generous contribution of a total of 6 gifts for the pilots in attendance. Also, special thanks to the executive members who helped organize this event, especially Sue MacDonald who was running the registration desk, and to our dedicated canteen workers Jim Denyer, Jessica Dawson, and Bob and Sheila Myhara, who did an excellent job feeding all in attendance. We also had the privilege to shake hands with our Zone Director, Chris Malcomnson. Thanks for coming out and supporting our club. We had the opportunity to see several types of aircraft, helicopters and drones. We were also lucky to have 5 pilots with special jets who were coursing our sky with their bullet beauties. Lunch hour saw fantastic special demonstration flights from Stetson pilots including Paulo De Sousa ( 3D Style) and beautiful flying demonstration by Scott Clarke. We also presented, after the fact, the People Choice Award trophy to Elckar Monsalve; presented by Hal MacDonald, Vice-President. (We forgot to present it at lunch time -- Sorry Elckar). We thank you all for attending today. ...the annual Stetson Winter Fly Event! 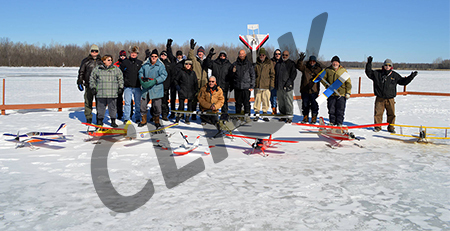 Don't let the -20°C fool you; a chance to fly with a great club, other MAAC Zone G club members, and spectators; how can one not enjoy themselves; warm shelter, hot coffee, Sue's chili, Timbits, home made cookies (thanks Debbie), sure beats a warm day at work anytime! A special thanks to our sponsors, and volunteers who braved the cold to make this another great Stetson Flyers event. Thanks guys, your time and effort greatly appreciated - you make these events happen! ...the annual Stetson First Fly Event! After a blustery early morning following a snow storm, some 19 members were treated to sunny skies and moderating winds for the 2017 edition of Stetsons' First Flight. With several inches of fresh powder down, it was a perfect runway for the event! 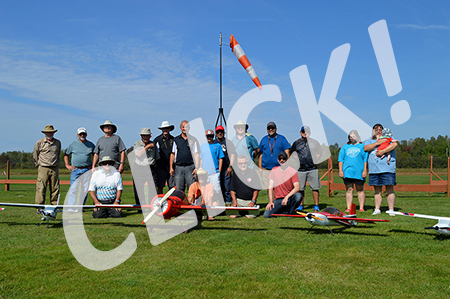 Sue and Hal MacDonald had everything ready to go for the 9 AM start, and eight electric aircraft were airborne in no time flat, with Jim Denyer winning the honors as first electric airborne for the year! It was great to see all those WHITE airplanes up flying around....don't know how they kept track of who was flying which, but they did a great job! The Gas/Glow guys were ready right after the electric crowd came in and gave them some room. Four pilots were flipping like mad, and Charlie Caldwell showed us all up by getting his 35 glow-powered flying wing running first, and launched for the 2017 honors. No incidents occured, a great way to start off the year! Mind you, some combination of wind gust, frozen thumbs, numb toes, and numb brain gave me a wake-up on my landing attempt. The trusty Twist dropped about 3 feet, bounced off the soft snow to my surprise, and gave me a chance to goose it and go around again! BONUS!!! Hal and Sue had lots of hot coffee, compliments of McDonald's, and some delicious rice crispy squares. They also rounded up two very nice hand-crafted trophies from John Jackson for the winners in Electric and Engine classes, along with $50 gift certificates from Princess Auto! Very nice! Thanks for running the event, you two. Great job! A big shout out goes to Daniel Marcotte, Hal MacDonald and Paul Abouassali, who were out early shoveling pathways to the setup tables, the shelter, washroom, etc. Our parking lot and access road were well plowed, and the field is very flyable, so for all you members who are getting cabin fever, go fly! The shelter and propane heater are working very well to thaw out between flights. Thanks again to Goose and Dan for the photos shown here & Hal's pictures on the Stetson Facebook page. We all really appreciate the results! So it's official, all you Stetsons: 2017 has launched successfully at Stetson Field.